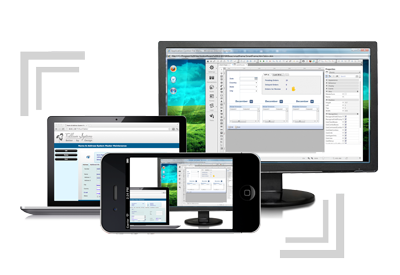 smartclient and the IDE runtime allow you to automatically capture host screens as you navigate through an application. 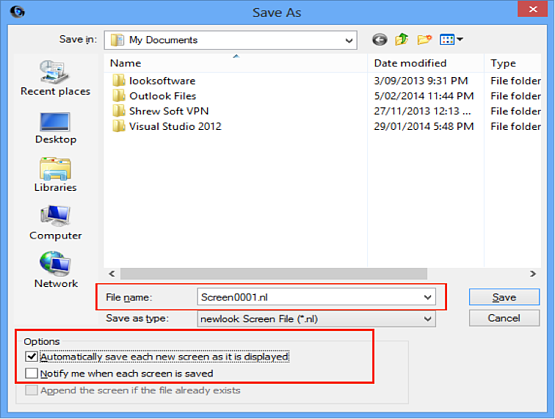 Each screen sent by the host is saved as a discrete file with a file name that gets incremented automatically. 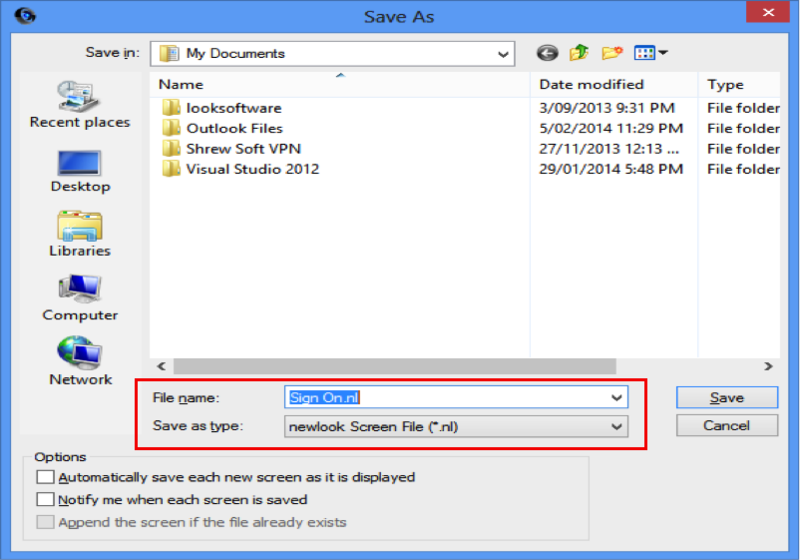 To create a continuous capture follow the previously mentioned steps for saving NL files within smartclient or the IDE runtime however before clicking on OK, select the option to ‘Automatically save each new screen as it is displayed’. Once you have saved your nl captures you can view them within smartclient/developer at any time by simply selecting File | Open and choosing the individual file to load. If you wish to play back a sequence of nl captures you can create a list file (nll) which is a simple text file that contains the names of the individual nl files you wish to open in sequence. To create a nll file you can either manually produce a text file using an editor such as Windows notepad or you can create the file using a DOS command e.g. This will create a file called ‘mylist.nll’ which will contain a list of all the nl files within the directory. To open the nll file, within smartclient select File | Open (or CTRL-O) and browse to the directory containing your nll file and open it (the nl files need to be in the same directory as your nll file). To navigate through your nll file simply press Enter to move you onto the next screen or press Page Down or Page Up to navigate through the screens. I hope this has helped you. Please tell us if there are other areas we may be able to provide tips for.